The Consumer Technology Association (CTA)™, which produces the world's largest annual innovation event, is now using www.cta.tech as its primary domain. Formerly, the Consumer Electronics Association (CEA)®, the non-profit organization unveiled its new logo and introduced its new name — the Consumer Technology Association (CTA)™ on November 11th at CES Unveiled New York, a half-day event offering a sneak peek at the year's most innovative products and technologies two months before CES 2016®, which will unite more than 150,000 retail buyers, distributors, manufacturers, market analysts, importers, exporters, and press from 150 countries. The non-profit organization was earlier using the domain www.ce.org which now redirects to www.cta.tech. "As we researched top level domain names to accompany our recent rebranding, we quickly realized that dot tech was the most appropriate and accurate. The domain clearly aligns with and reflects our vision of our organization and today's consumer technology industry — fresh, expansive, pioneering and innovative." Tech leaders have led the early adoption and usage of .tech through innovative and creative ways. Viacom — the world's sixth largest broadcasting company is using www.viacom.tech to showcase projects like the apps developed for its brands like MTV, Nickelodeon, Comedy Central etc., their agile software development, active participation at technology events and commitment to open source. Carl Pei, the co-founder of the One Plus mobile phones, who admits not having written anything in almost two years since OnePlus started, is using 'carl.tech' as his personal blog. 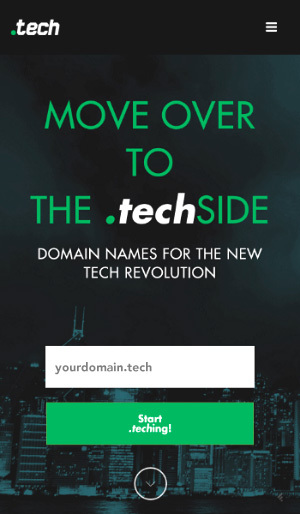 New domain extensions like .tech were launched with the intent of making it easier for consumers to register a meaningful website name of their choice. Consumer skepticism towards any new product is inevitable, but usage from the likes of Google, Amazon, General Motors, Abbott, Sony and others has significantly helped validate the utility of new domain extensions. Dot tech domains are available across leading registrars like GoDaddy, Name.com and can also be registered at www.get.tech.